This guide provides citation and bibliography assistance. Includes APA, MLA, and Chicago style examples. How do I choose the right tool? It depends on your personal needs and preferences. This comparison chart can help. Citation Management Software, Data Services, HPC Classes, Readiness, Health-Sciences-Specific, & Grad-Student-Specific. Bobst Library offers (one-shot) classes that cover citation management, data use and management, high performance computing, and general research skills. Just need to format a few references? Free and simple online citation building tool from Hekman Library at Calvin College. 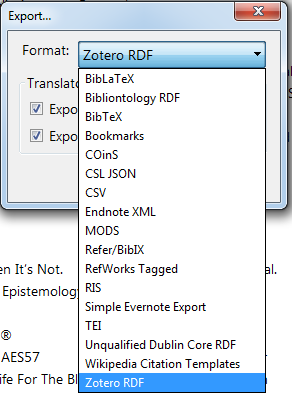 A free and quick citation tool from the makers of Zotero. 2. 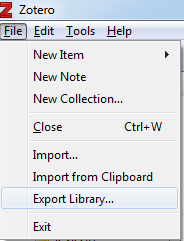 Make sure both notes and files are clicked so you export everything! 3. Pick which format you'd like to export. We recommend exporting as a CSV for your archival copy, and also as BibLaTex, particularly if you want to import your library into other programs. BibTeX files can be used with LaTeX software to create citations and bibliographies also. 2. Pick your export format. We recommend using BibLaTex as your archival copy. BibTeX files can be used with LaTeX software to create citations and bibliographies also, and most other bibliographic managers allow import of BibLaTex files. 1. Open the library of references you want to export. 2. In the toolbar at the top of the screen, click "Select Another Style" and select BibTex Export. BibTeX should be your archival copy. These files can also be used with LaTeX software to create citations and bibliographies. 3. Go to File > Export and save the file. 1. Go to References > Export or Tools > Export, depending on your version. 2. Select All References or a specific folder of references you want to export. 3. Under "Export Formats" select BibTex and XML. XML will be your archival copy, and BibTex will be the secondary copy, one which you can import into other reference managers or use with LaTex software. 4. Click "Export to Text" and save. A free download that works with your web browser. 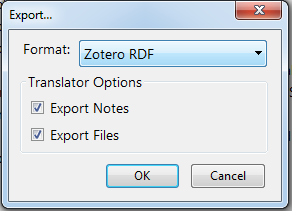 There are two options: Zotero for Firefox is a Firefox-specific extension that offers the full range of functionality. Zotero Standalone -- a separate browser-independent application that can be used with Chrome, Safari, or Opera -- offers slightly less functionality than the Firefox extension. NYU purchases a campus-wide subscription to this web-based service that covers all members of the NYU community. Because RefWorks is web-based, you can use it from any Internet-connected computer/device on campus or off. NYU has a campus-wide license to this software, which you download (at no cost to you) to your laptop or desktop computer. The software includes a less developed web-based component called EndNoteWeb, which can be used to sync across multiple personal computers. Mendeley is a free citation manager with editing functionality in both a web-based and a desktop application. There is also a browser plug-in (compatible with most major browsers) for saving citation information from websites. *While these tools are not Web based, meaning you need to download a desktop application, they do have a web component (which can be used without being on the desktop download and which can be synced with the desktop). **NYU Libraries licenses the use of RefWorks and EndNote for NYU students and faculty. ***Can pay for a more robust subscription, but the basic package is free. ****PDFs may be shared in private groups (size of group depends on tool, as does the amount of free storage available for PDFs). Handout from our "How Do I Choose?" workshop.